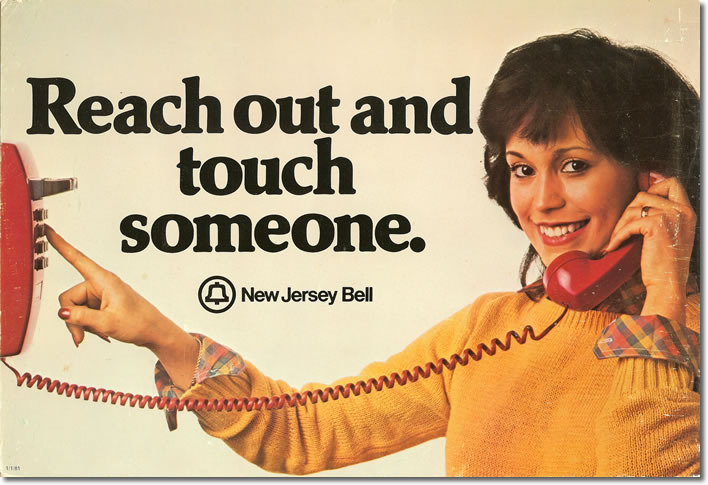 There used to be this great tv commercial when I was growing up and the slogan was “Reach out and touch someone”. The ad was for the phone company and it was all about picking up the phone and talking to the people you care about: friends, family, etc.. It was touching and I’m sure it encouraged many to go ahead and ring up those loved ones they had put off ringing up. Of course, this was years before the advent of mobile phones and text messaging. When text messaging became available, I rejoiced. I thought, “Oooh, I may never actually have to make a phone call again.” This is because I have a phobia, arising from fear of rejection, of making phone calls. Honestly, if you have ever received a phone call from me you must understand that it made me physically sick to my stomach and I probably deliberated for a long time about it and I first would have begged my mother or my husband to call you for me, and then if they refused I would sit there and stare at the phone in agony before finally making myself make the call. No matter how many times I face this fear and actually make a call, it never ever ever gets any easier. So, text messaging certainly seems to be the thing invented for me. Right? Well…you’d think so. The problem is, like all text related forms of communication, it’s easy to have misunderstandings, it’s very easy to misread the “tone” of a message. There’s no voice inflection and no way to really prevent getting the wrong idea sometimes. So, today when I got a message from a friend that took a major detour from our present conversation, I assumed it meant something that it didn’t mean, because I caught a different “tone” than what was intended by the sender of the message. So, I sent back something I thought was appropriate. However, lo, and behold, it was anything but the right thing! I had gotten the wrong end of the stick and the message I sent back upset this person – a person who means a lot to me. They’re not talking to me now. This is pretty heartbreaking since I don’t have many close friends that live close to me, and I hate that I have lost another one. I have a difficult time making and keeping friends. The last time I lost a friend was simply because the person decided I didn’t really fit into their life any more. So, mostly on their part, the closeness of friendship, sadly, ceased. But, this time it is my fault. This time I am to blame. I mean, I am to blame, right? I can’t honestly blame the technology? I can’t just sit here and bemoan how I was born in the wrong era, can I? i.e. I should have been born (to a noble family) in the middle ages. No phones of any kind. You either got a scribe to pen you a letter, or you talked face to face (and the letters were usually summons to come and see one face to face).